Long Island, New York. Home to some of the most extravagant mansions and estates in the world. Oheka Castle in Huntington, NY. The deSeversky Mansion and Conference Center at NYIT. The Glen Cove Mansion. The Royalton at Roslyn Country Club. The Bourne Mansion in Sayville. Coe Hall at Planting Fields Arboretum in Oyster Bay. Mill Neck Manor. The Vanderbilt Museum in Centerport, NY and this one: Fortunoff Hall on the grounds of Dowling College in Oakdale. I have had the experience of taking wedding pictures at all of these elegant venues in my years as a Long Island and New York City (NYC) wedding photographer. This picture was taken in the grand ballroom of Fortunoff Hall. The room is empty because the couple rented the mansion just for their wedding photos. After the photography session we would travel to their reception venue, Carlyle on the Green at Bethpage State Park for their amazing wedding reception. 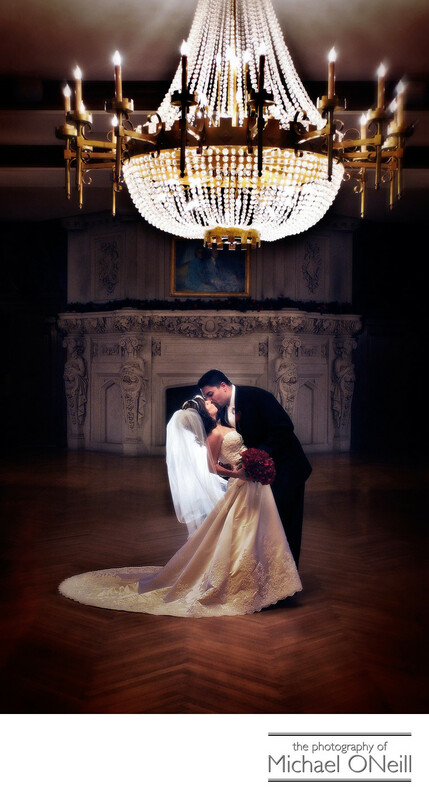 If you are planning a Mansion wedding or a celebration at any of the Carlyle venues, give me a call. I’d consider it a privilege to create awesome pics for you on your wedding day.